This review was really hard to write. I didn't hate this movie, I didn't particularly like it, I'm aggressively ambivalent about it. When that's the case, it's really hard to praise it, yet hard to trash it. I watched all of it, so I figured that I might as well make an attempt to write a review. This is one of those movies that's hard to tell much about without any spoilers, but I shall do my best. Mutants has promising start. It begins in the middle of a zombie apocalypse, where apparently most of the population has been infected with a virus, that has turned them into zombies (unfortunately, the running kind). Our main characters are Marco and Sonia, a couple who happen to be EMTs, who are attempting to make their way to the safety of a military base. They don't quite make it there, and have to hunker down in an abandoned building, after. Along the way, Marco becomes infected, and the rest of the film involves Sonia trying to cure him, while they are waiting for help to arrive, and some of the usual elements of this genre (an incursion by other survivors, and a zombie siege). 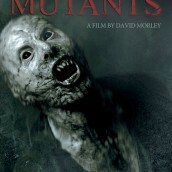 Mutants attempts to do something different within the genre. Many of these type films are so packed with zombie attacks that they don't have much time to get into interpersonal interactions. This film spends too much of its run time, actually most of the time, doing that. This is an interesting touch, watching Sonia deal with Marco's gruelingly slow transformation into a zombie. However, the downside of that aspect is that about an hour of this film, except for Marco, is zombie-free. Either they had that much because they couldn't afford more zombies, or they didn't have many because of the story, whatever. Before I get into what I didn't like about this film, I'll address what I actually did like about it. It is very well-made, the characters are well-written, and acted, the cinematography is great, as are the effects, most dealing with Marco. The aspect of dealing with Marco's transformation, and Sonia dealing with it are very effective, but did I mention that it takes up way too much of the movie? It does, and it becomes annoying. The reason that she goes to such lengths is explained late in the film, but I won't spoil that for you, in case you decide to give it a viewing. Now, let's review what I didn't like. First, for a zombie apocolypese, it was pretty meager. There were maybe twelve of them in the entire film. Also, our protagonists are able to drive for quite a while on roads, where there is not an abandoned car in site. This is the first time that I've ever watched anything that is zombie-related, where the characters do any amount of travelling, and the roads are not blocked at all. Also, there is a disappointing lack of carnage. Did I mention that there aren't many zombies? There aren't any burning buildings, and pretty much any structure they enter is pristine. The building Marco and Sonia end up staying in basically looks like everyone had just gone home for the day, and there are virtually no signs that anything is amiss in the rest of the world. There's also electricity. If the apocolypse has been going for as long as the hints that it has, would there still be electricity? In this genre, of the first things that people usually do when they find shelter is to harden it, boarding up and blacking out, to try to keep zombies out, and not draw attention to their location. Do Sonia and Marco do this? Noooo, of course not. Not only do enter the structure, and not even appear to make a feeble attempt to secure themselves against intrusion, but they don't even attempt to hide their presence. I found myself getting distracted, looking for ways that I could secure myself, in that situation. When they first arrive inside of the building, there is no power, but after a search, Sonia finds a breaker box. When she turns on the power, there is an outside shot, and the building lights up like a Christmas tree. I doubt that she even bothered to go around to turn out any of the unnecessary lights, it's just that kind of movie. Unfortunately, as is shown later in the film, other survivors don't even attempt to harden their location either. What is it with the French? Probably the thing that bothered me the most of all is that not only did Marco's transformation take place over a couple days, but Sonia's carelessness during the situation. Not only does she not kill him once she figures out that he's infected, she doesn't even bother to restrain him. Look, I understand the reluctance to kill a loved one when you know that in short order he'll be set on making a meal out of you, I can't say that I'd react any differently, but at least take measures to protect yourself. Good grief, how did she survive so long? I also understand maintaining the hope that once help arrives, the military will have found a cure, and Marco will be okay. However understanding I may be, once the dude starts vomiting blood, and growling and snapping at me, he's either going to be put down, or at least restrained. Our female protagonist never attempts to restrain Marco, this, he's able to terrorize her throughout the film, until his change is complete. After he tries to gnaw on her, he tells her that he's sorry, and she forgives him. This reminds me of the parable of the scorpion and the frog. Another issue with this film is the zombies. First, they run. It's sad that these days, I'm surprised when a zombie movie has ones that don't run. Outside of trying to make things more exciting, or the MTV influence, another possible reason for running zombies occurred to me while I was watching this film. When zombies run, it's more difficult to focus on their features, because of some blurring & shakiness of the picture. This possibly enables the filmmakers to use less detailed makeup for the ones that aren't featured. Using the right type of lighting and shadows also helps this. That being said, Marco's makeup is very effective. Secondly, there just aren't enough of them in this film. There are maybe a total of a dozen here. If you you're going to portray a zombie apocalypse, try to make it convincing. While this film has good production values, it appears to be low-budget, which would explain the measly number ghouls. In films like Rammbock: Berlin Undead, it is possible to be convincing with a small amount of zombies, if the setting is in close quarters. Unfortunately, this film's setting is too wide open for that to be done. Finally, the zombies stray far from the canon that most films of this type stick to. In most works in this genre, the transformation occurs quickly, in minutes or hours, if not instantaneously, so that the uninfected often don't have time to prepare or react. If a transformation occurs over several days, how did the apocalypse happen? You know there's no cure for the condition, you know if someone's infected, and will turn, make preparations, if that's not done, maybe zombies deserve to rule the Earth. Also, zombies only attacks are usually grabbing and biting. Here, our ghouls hit, even straddle a victim, and pummel them MMA-style. The final violation is the way they are killed. It's pretty standard with this type of undead that the only way to kill them is to destroy the brain. A couple of them in this film are killed by damage to their throats, and bleeding out. That's just unacceptable. A few are burned, but that's acceptable, since theoretically, the fire damages their brains. In spite of my criticisms, this is a decent film. It's shot well, has decent effects, the acting is fine, and it had an interesting concept. Unfortuantely, I had too many problems with it, and it was too slow, for an extended amount of time, for me to fully recommend it. Did I mention that there weren't enough zombies? It is in French, with subtitles. Its run time is 1 hour, 29 minutes, and it is rated R. It is available on Netflix Instant. I give it 2 1/2 out of four purple zombies.